I am not, nor ever have been a fan of the “beautiful game”. I was never born into a football family. My old man’s thing was religion not sport. So, the footie culture and all its good and bad trappings was always something that I was apart from. An observer looking in, no more. That being said, Abide With Me is an absolute straight-in-the-back-of-the-net knockout of a story and the loyalty and comradeship found in footy is at its heart. The story itself is a familiar one to anyone who grew up in seventies and eighties Britain and all the culture and politics that time was seeped in. It is the story of a friendship. Although, an unconventional friendship, it certainly is. John is a working-class kid who enjoys nothing better than a kick-around after school, while his parents struggle to make ends meet. Into his life comes Kenny. An abused misfit and from the first encounter, a relationship is forged that will take them both into the darkest places imaginable. The places that social workers fear to tread. All through this downward spiral is the football. The little triumphs and despairs. The tribal loyalties and their foes. The things that keep desperate people getting up in the morning. This book is part crime novel, part kitchen sink drama, yet there is always that resilient humour, deep down inside the characters, and the writing really reminded me of the old master Alan Sillitoe. As I said before, a knockout. Put it this way, at one point, I actually had a tear in my rotten old eye. Me. Those of you who have been following PMM for a while will know that Ian holds a special place in the hearts of our readers. It was on these very pages that Ian’s first story was published on the internet. I was very happy to chat to Ian about his novel. 1: First off, Ian, the nuts and bolts. How long did AWM take to write and what were the hardest parts for you to get down on virtual paper? All told, the first draft took about three months, the last third – about 20,000 words – I wrote in about a week. The whole thing was written waiting for trains and buses, queuing up at the supermarket, pushing the littl’un round the park, and waiting in the school playground. The hardest parts to write, for me, were Kenny’s diary entries and the writing of the final page. I wrote both, tears running down me face. 2: Who are/were your literary inspirations and what have learned from them? I love Virginia Woolf. For me, she taps into that darkness inside us all, communicating it with gut-wrenching beauty. Through the beauty of her language she reveals the spaces between the words, that place where words can never be enough. That, for me, is her real genius. 3: This book seems so personal and intimate, how much of it was based on real life? I’d say pretty much eighty-five per cent of the book is based on people I’ve known, experiences I’ve had, and incidents from my childhood. All of the characters are either composites of real people or real people in their own right – names changed to protect the innocent sort of thing. The book is written, as you know, Jason, in the first person voice of John. All of John’s fears, insecurities, hopes, failures, in short – feelings – are all mine. Just the situations are slightly different. In short the only thing that is different from ABIDE WITH ME being almost completely autobiographical is the plot. The plot is entirely fictional. The inner life, the subtext, if you like, is my soul laid bare. 4: Football and the loyalty and violence that came with the beautiful game in the seventies/early eighties are major themes of the book. Are you a Hammer and if not, why did decide to write such a beautifully sad ode to the team? Any reactions from any other fans? For me, the football in the book represents the one thing that makes sense in a broken world. Although I allude to the violence prevalent in the football arena in the seventies and eighties, the violence in the book is more connected with the situations John and Kenny find themselves in away from football – domestic abuse and bullying at school in the case of Kenny, and the harshness of the prison system and in the case of John. And no, I’m not a Hammer. Although I was brought up one from an early age. I remember the seventy five cup final, and I remember getting a statuette of Bobby Moore as a young kid. But I’m pretty much a lifelong Dagenham and Redrbridge supporter. Again, as in my answer to the previous question, all of the episodes in the book connected with watching football from the terraces, are my experiences with Dagenham transposed. As far as the reaction of other fans, one of the key things for me was that the book passed the ‘die hard Hammer’ test. To this end, I went onto several Hammers forums and asked if anyone would like to read the couple of chapters in the book explicitly involving West Ham – one chapter a blow by blow account of the 1980 FA Cup Final, plus the chapter preceding that – the morning of the game. The feedback I received was unbelievably, and universally, positive. Comments such as ‘brought a lump to my throat’, ‘it was just like being there all over again’, etc. were common. In this process, I also picked up some titbits of anecdotal information that I slotted into the book, for which I am very grateful. Two die-hard Hammers – Trevor Drane and Robert Banks – were kind enough to read the whole of the book. Their enthusiasm and their love of the book fair blew me away. Thank you, lads. Owe you both a pint one of these fine days. One each, even. 5: If AWM was turned into a film who would direct and star in it? Why? Pretty much everyone that has read the book has mentioned the cinematic qualities of the writing, which is nice. I’ve always seen the book being played out in my head as being directed by Mike Leigh due to his attention to small, seemingly insignificant details and the reality with which his films are imbued. As for who would star in it, the voice of John inside my head has always been Ray Winstone. Unfortunately, the book ends when John is twenty-four years odl, so dear old Ray would be a touch too old for the part. I don’t watch many films, and in my head I can’t see much further than a twenty-four year old Ray Winstone playing John, which sort of makes the casting a little difficult. 6: What is your next project? Any ideas, yet? I’m writing a novella at the moment for Byker Books, which will hopefully be released some time in 2012. Other than that, I want to get back to writing some short stories with the view to getting a brand new collection out next year. 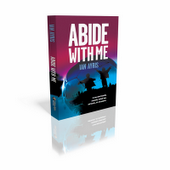 As for the next novel, I’m so engrossed in the promotional stuff for ABIDE WITH ME at the moment, I’m finding it difficult to clear a space in my head to concentrate on anything of a novel length. But it will come. Just a matter of sitting and waiting, and drinking loads of coffee. And purple Yorkies. Lots and lots of purple Yorkies. I also think Shane Meadows would do a good job of directing this kind of thing. Great interview. Lovely insight from a terrific writer; can’t wait to get hold of a copy of AWM. Many congrats, Ian and very well deserved. Tip top, Mr. Ayris. Remember to save me an autographed copy of this baby, mate. Been a long, hard time a’comin. Gonna be a smash I know. Ian writes with great subtelty and realism. I look forward to reading this and wish him every success, great interview Jason. I’m eating up Abide With Me. It’s really moving stuff. I think everyone who reads PMM knew from the first time they read Ian Ayris that he was destined for great things. Ian has the talent to go a long way. And I hope he rides the wave straight to the top rung! Hi all. Just want to thank every single one of you for your kind words. So glad these seven names have appeared together. Each and every one of you, in your own ways, have given me such fantastic support and encouragement over the past couple of years with my writing. Proper indebted, I am. Paul, U.V., Alan, AJ, Richard, Chris, B.R., and, of course, Jason, I will one day be having a drink with each of you to show my appreciation. Can’t beat a pint of London Pride. Speak to you soon, lads.